Whistler’s work at this time uses the formation of a grid on the canvas to map out the composition; a frequently used device at this time among aesthetes including his contemporary and good friend, Albert Moore. In Nocturne: Blue and Gold – Old Battersea Bridge the use of a grid formation is evident as all lines in the pictures are parallel to the sides of the canvas, except occasional “deviations” of a diagonal figure such as the barge or the curve of the bridge (see fig. 1). Critics of Whistler and his series of ‘Nocturnes’ would argue there was no composition, as their understanding of it was how to place characters in order to suggest a narrative. Reflecting now on the period of ‘art for arts sake’, however, this grid pattern is utilised to present an aesthetically pleasing composition of simple objects in a picture. The simplified composition is furthered by Whistlers use of Horace Lecoq de Boisbaudran’s method of painting from memory. Lecoq de Boisbaudran’s system is described as “memorising the primary forms of a scene and then transporting them to the canvas”. This method hugely simplifies the scene as only what is important is remembered and transported to the canvas. As well as influences stemming from the aesthetic movement and French artist, Lecoq, Whistler drew largely upon Japanese art. 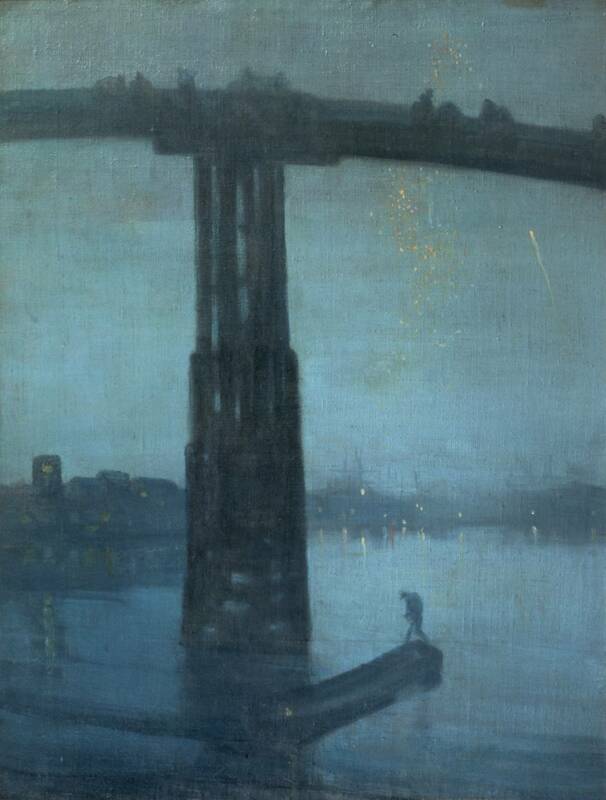 Nocturne: Blue and Gold – Old Battersea Bridge is described by Robin Spencer, Senior Lecturer of Art History at the University of St Andrews, as “the most Japanese of all Whistler’s nocturnes”. This painting is often compared to the work of Ando Hiroshige and particularly the Kyo Bridge and the Bamboo Bank of the Sumida River from the series ‘One Hundred Views of Edo’ (see fig. 2). In comparing these two images they present a very similar composition with the representation of a cropped bridge, a silhouetted skyline stretching along the river and a small boat or barge sailing along the water. It is easy to see why the two are so often compared although Hiroshige’s presentation is far more directly representational of the scene than Whistler’s is. Donald Holden also compares the consistency Whistler’s “heavily diluted paints” to Chinese ink. Although it would be easy to suggest that Whistler chose this subject to copy Hiroshige’s painting of the Kyo Bridge and the Bamboo Bank of the Sumida River, the Battersea Bridge and the river Thames was a subject used a lot previously by Whistler. A journal article in 1998 tells us how Whistler was interested in the transformation of the river during this period as it was developed to cope with modern times – for example, “to facilitate commerce and transportation”. Although Whistler painted this from memory, took influence from Japanese Hiroshige and has distorted the shape of the bridge, we know that he actually would have been very familiar with it. The same article tells us that from the upstairs window in his house in Lindsay Row, the bridge could be seen connecting Chelsea to Battersea over the Thames. The paintings influence within the Victorian art world is also notable. This painting was used as evidence during the Whistler vs. Ruskin trial in November 1878. In Robin Spencer’s ‘Whistler: The Masterworks’ we see that during the trial Whistler confirms the fluidity of the paintings composition and meaning. He states that he “did not intend it to be a correct portrait of the bridge” and that his intention was not “simply to make a copy of Battersea Bridge”. When questioned if the figures on the top of the bridge were of people, Whistler replies “they are just what you like… that depends upon who looks at it”. The painting was not well received in its time and the series of ‘Nocturnes’ are still considered as “the most controversial pictures of his career”. Whistler’s contemporaries considered the ‘Nocturenes’ a “joke”, misunderstanding his perception of the Thames. When presented for sale at Christie’s in 1886, the painting was hissed.